Aside from the red packets, Zayden was given a whole bunch of baby clothes from Carter’s by relatives who had just returned from the states. I shall post photos of the clothes once I find out where the mother-in-law has stashed them. 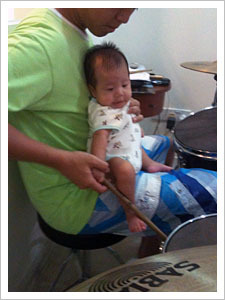 My little drummer boy Love! he’s awesome. looks so natural and comfortable holding the drum stick. our son rocks and I love you too. What a gorgeous baby he is! I’m glad I stopped by for a peek! What a sweet little boy. He does seem to be a natural with the drums. I am a classmate from Blogging for Scrapbookers. Zayden Asher – Great name and lovely photos! what a cutie! I love Carter’s clothing, they last so long!! Those are some cute pictures. I think I see a scrapbook page with them in your future. Zayden’s looking cuter by the day! 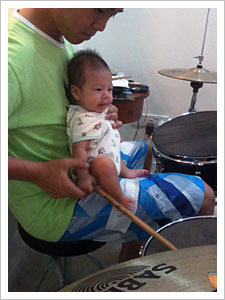 Aww, cute lil’ drummer boy When he’s in a band you’ll be able to tease him with these pics!